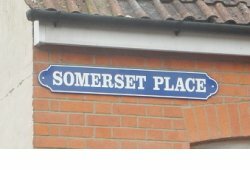 Somerset Place is a small terrace of six houses that were built between the Yeovil to Durston railway line and the rear gardens of Aldon Terrace, Hendford Hill, in the 1890s. The terrace is reached from the small lane on the southwestern side or the Railway Hotel (on the right as you look at the front of the hotel). The 'front' of the terrace was built facing the railway line that ran just yards away, alongside the terrace - indeed, the southwestern house of the terrace was almost touching the railway tracks. 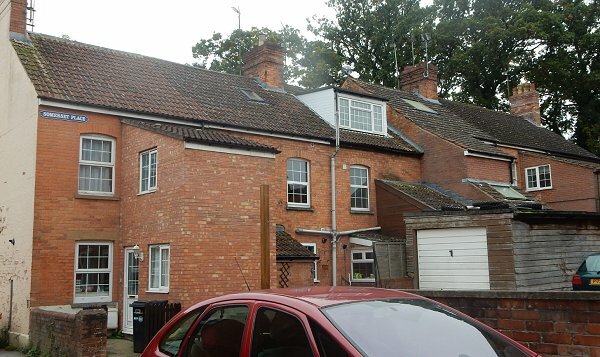 Today all the houses have later two-storey extensions at the back. In the 1901 census a total of 25 people lived in the terrace; the families of coal merchant's carter John Pike, insurance agent Hiram George, another coal merchant's carter Christopher Beare, railway platelayer William Worner, stone-works oil engine driver Claude Miller and finally yet another coal merchant's carter John Davidge. The fact that the coal yard was located across the other side of Hendford is the reason there were three coal merchant's carters in the terrace. 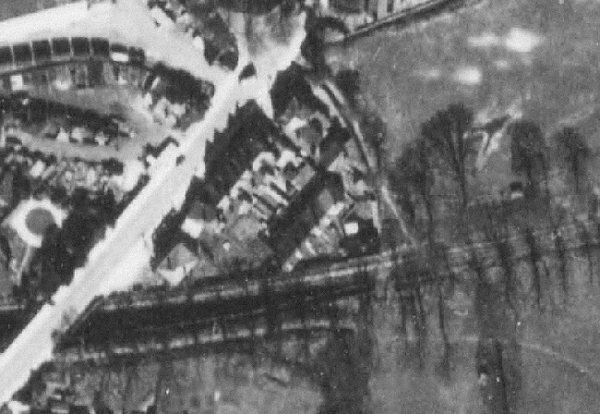 The aerial photograph of 1946 showing Somerset Place at centre. Above and to the left is Aldon Terrace and the Railway Hotel. The railway line runs across the photograph, almost touching the southwestern house of the terrace (although the railway is in a cutting at a lower level at this point). Hendford Hill runs diagonally from centre top to bottom left. The field in the top right quadrant is now the site of Goldenstones Leisure Pool. The 'front' of Somerset Place 'borrowed' from the 2009 image on Google Earth. .... and seen from the line of the old railway. Photographed in 2016. 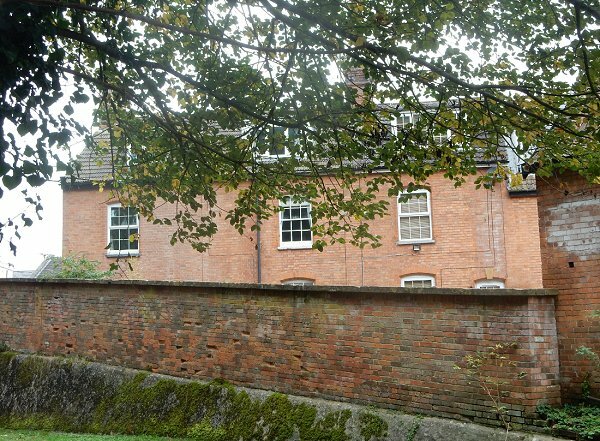 The 'rear' of Somerset Place, seen from the lane alongside the Railway Hotel (which I had my back to taking the photograph). Photographed in 2016. 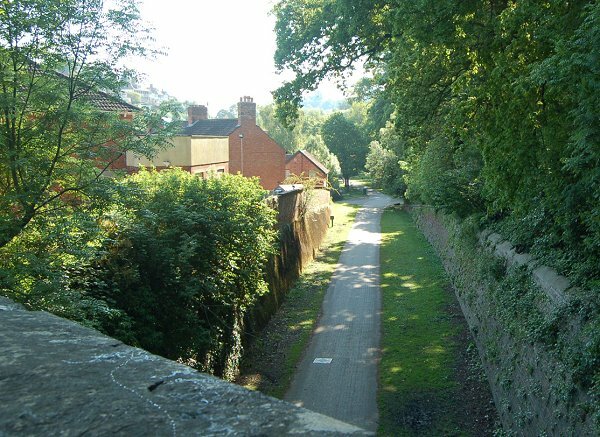 Taken from Hendford Hill bridge over the old railway line, the end wall of Somerset Place is seen just left of centre showing just how close to the railway it was built. Photographed in 2013.